Deer me!!!! In the forest live millions of different animals. From the mischevoius squirrel to the proud stag. Some live in trees yet some live on ground. Lots of small forest animals can be classed as small pets aswell. Like the rabbit. Naturally a woodland creature, but easily tamed. Because humans have tamed most animals and breed young in a domestic way, these pets can never be returned to the wild. 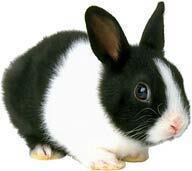 This type of rabbit is a domestic creature. It eats grass, and an assortment of vegtables ( rabbits eat their greens!! Why shouldn't we!!) You can tell this type of rabbit is domestic, a wild rabbit would probably be a light brown. 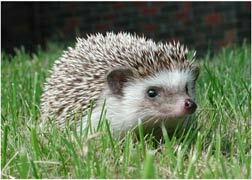 The hedge hog, a small spiked creature adapted to city life. When in danger, the hedgehog can curl up into a ball. Because of its spikes, the predator can not get near it! I saw one of these under the car only a few days ago!! A brown bear. Commonly found in America. The U.K do not have any original species of bear. Remember, if you see a cute, furry bear cub, do NOT be tempted to go any closer or pick it up. Remember, where theres a baby bear, theres a mummy bear!! Squirrels are small furry creatures. They rather resmemble a rat. They have a long bushy tail, and live in trees. They can jump from branch to branch! This is a red squirrel, they are quite rare. 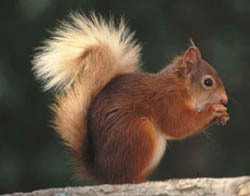 The grey squirrel was brought to England on boats from spain, and was said to have overun our natural red squirrels. Fox's and wolves are also forest animals. Please see the big dogs page for information.